Pack it in the lunch box or slip it in the hiking pack - these beautifully-illustrated, eco-friendly stainless steel drinking bottles are great to use with water, juice, or milk. An earth-friendly, reusable alternative to plastic and other epoxy lined metal containers. 100% recyclable. Made of # 304 food grade stainless steel. 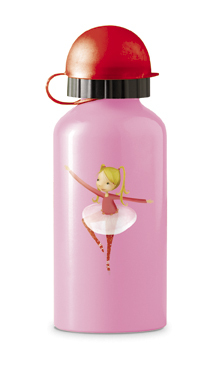 Lead safe, Phthalate, and BPA free. Conforms to or exceeds U.S. and European safety standards. Measures 7" H X 2.5" D.